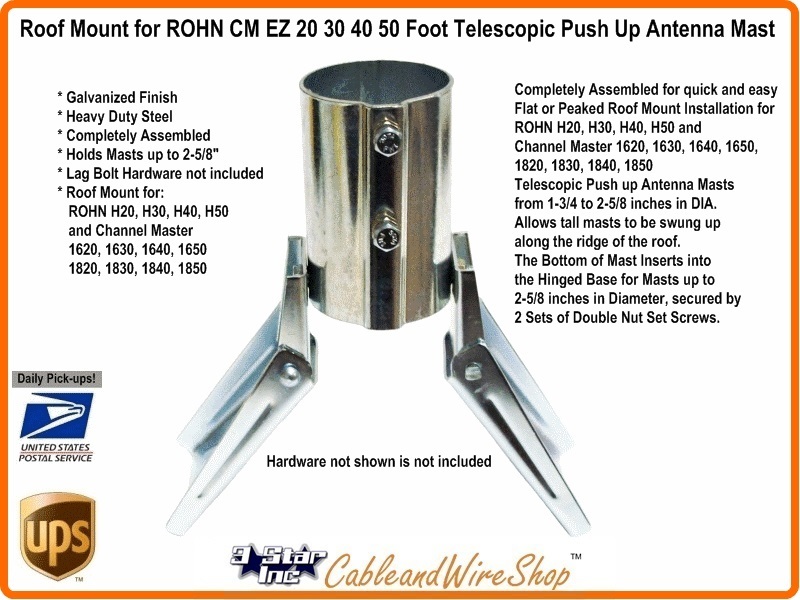 Holds Masts up to 2-3/8"
Is completely Assembled for quick and easy Flat or Peaked Roof Mount Installation for ROHN H40, H50, 9H50 EASYUP TM40, TM40U, TM50 and Channel Master 1640, 1650, 1840, 1850 Telescopic Push-Up Antenna Masts up to 2-3/8 inches in DIA. Allows tall masts to be swung up along the ridge of the roof. The Bottom of Mast Inserts into the Hinged Base for Masts up to 2-3/8 inches in Diameter, secured by 2 Sets of Double Nut Set Screws. Bonding should be made by affixment to Mast. Consult NEC and Applicable Local Code for further guidance.